Donors and corporate partners recently gathered in the Dean’s Boardroom to celebrate some of the most outstanding students in the Faculty of Business and Economics. Donors and corporate representatives presented their sponsored subject prizes to the 2015 recipients. 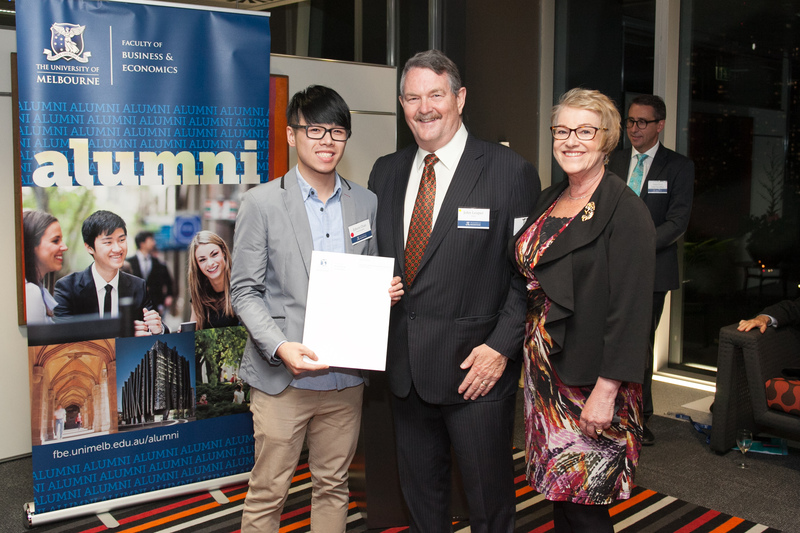 ‘I would like to thank the donor for this scholarship because it encouraged me to complete my research,’ wrote Edwin Chan, an Honours student and recipient of the Geoffrey Blainey Scholarship for Honours in Economic History. He had a chance to deliver that message in person to Dr John Leaper and Mrs Jenny Leaper, who established the scholarship. The Faculty values the opportunity to bring donors, industry partners and students together in this way. It is an occasion to recognise the direct impact of donor support on students poised to be global leaders in their fields. While bringing together donors and prize recipients is an important part of the evening, it is also a chance for the Faculty to extend its gratitude to those who make these awards possible. Thanks to their belief in the transformative power of education, over 350 students in 2015 were involved in our scholarships and prizes program in recognition of academic excellence, opportunity, and community involvement. If you would like to support FBE students and join our community of donors, consider making a gift to the 2016 University Annual Appeal. Photos of the evening are available here.